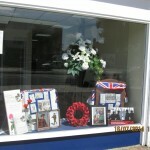 Along with all other Lodge Brothers branches in the region, the staff at Bedfont branch put together a patriotic window display this summer to commemorate the 100th Anniversary of the onset of World War 1. The display featured posters, newspaper clippings, poppy wreaths and flags. Many passers-by commented on how eye-catching the display was.